The two teeth responsible for this! The worst thing about teething...? nor is it the sleepless nights. ... it is the sore bum... and the screams when you try to wipe it. BUT it's terrible, and the skin doesn't just get red, it opens, like an open sore. The ONLY thing I have found that works is Bepanthen. I now swear by the stuff! And, if not, and the wiping is sore, dunk wee one's bottom half in the wash-hand basin, before administering the Bepanthen, and you DO see an improvement straight away, by the next nappy. The other thing... once you get the smell of poo, get that nappy off immediately! The longer it's in contact with the skin, the worse it is, even if you're only talking 20 mins. Aaron had a sore bum in Ireland and screamed when I tried to wipe it. Screaming like I'd never come across. I RAN to the pharmacy and got a small tube. Used it liberally and did not replace it. We got back, and for a while did not need it... I thought Sudocrem will do. One day I was out and I luckily thought to buy it. Teething revved up again and it was invaluable and this time I'd had the sense to get the huge tube. Anyway, Aaron loved playing with the tube and one day he left it in the kitchen. As teething was okay at the mo (this was over a week ago) I decided to just use Sudocrem. This was fine for 12-24 hrs, but unbeknownst to me teething again kicked in, and I was faced with a sore bum, and screaming and had to run the bum to the sink. Washing with water and even rubbing clean (in water) doesn't seem to hurt at all. BUT wiping DOES. So I am back to applying it sparingly at every nappy change, as a prevention as that is so much better than using it as a cure! A few weeks ago I had read about someone who had the same experience and I hunted round for the post, (so that I could link to it here) mistakenly thinking it was on this teething carnival, but it turned out it was here at Not Yet a Yummy Mummy. 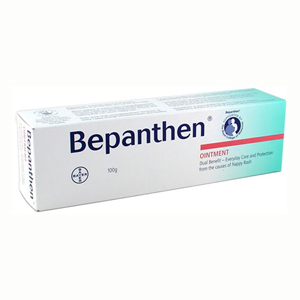 We used to love Bepanthen - until a really bad case of nappy rash and it didn't clear it up. My daughters bottom was so sore it was almost bleeding because of teething nappies. The only thing that worked for us was Metanium. Now I swear by that. Nothing worse than a baby with a sore bottom so glad Aaron got through it with the help of Bepanthen.